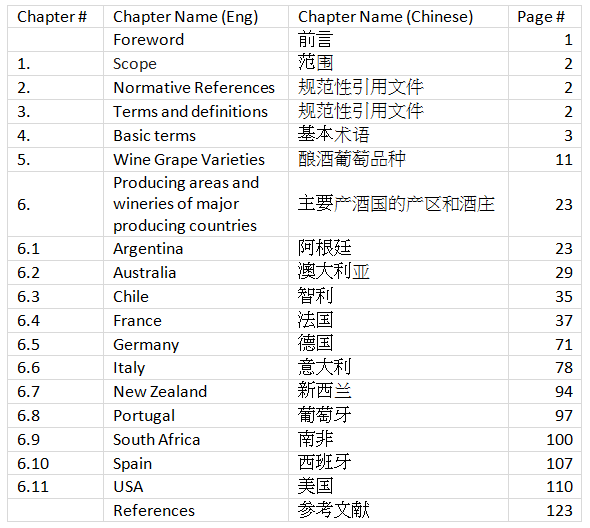 People's Republic of China domestic trade industry standards "Norm on terminology of imported wines"
Back late September 2017, I wrote a post about "Bordeaux 1855 Classification Chateaux Names with Chinese Name Translations" (read it here), as I had difficulties to find the Chinese translations of some of the Bordeaux Chateaux names on western websites (English and/or French) and on the Internet in general (except of course on https://www.baidu.com/) . In this previous article, I was providing you with a list of the Chateaux Names translated in Chinese characters, with 2 variants, as Chateaux names in Chinese may differ (written and pronounced) depending on the Chinese region (i.e. People in the Beijing / Tianjin area to the northeast of China might write and pronounce them a certain way, whereas the people in the Guangzhou / Shenzhen area might write and pronounce them totally differently). "People's Republic of China domestic trade industry standards - Norm on terminology for imported wines"
Today, I was given a very helpful document that seems to be more accurate and definitely more official, as it is a "People's Republic of China domestic trade industry standards" document used by Chinese Customs, which contains the norm on terminology for imported wines into China. The list in non-exhaustive as (of course) they couldn't cover all of the wine related words of the world, but it still contains valuable translations about pretty much every commonly used words related with wines. 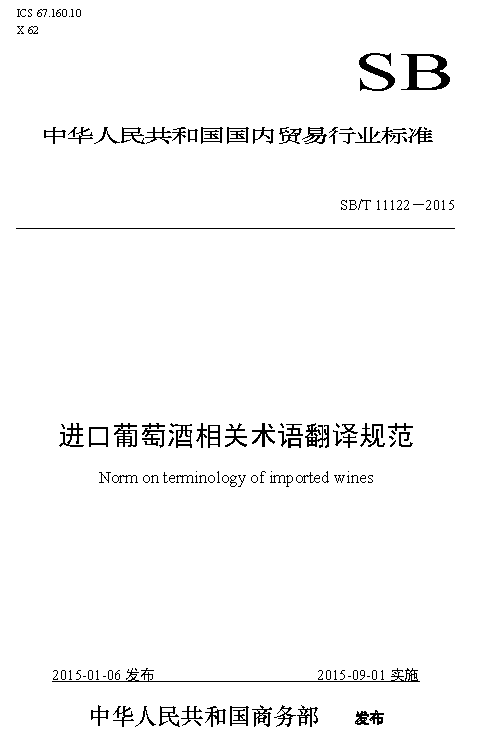 Although this document is dated as of 2015, and therefore certain things may have changed slightly since then, I think that it still can be considered as a good Chinese Translations Lexicon of the most commonly used wine related words and terminology used in China. And I'm sure that it will come handy for those of you who might have the need to know the Chinese Translations of some of these words, more especially if you have to deal with Chinese Customs (Negociants, Shippers, Freight Forwarders, Suppliers, Distributors, Retailers, etc....) or simply if you express the desire to know how it is written in Chinese for you own knowledge. Here is the table of contents as an indication of what you will be able to find inside this document. "Norm on terminology of imported wines"
After living in Hong Kong for nearly 7 years, I think that I have seen it all in terms of lack of manners, politeness, social skills and inadequate behaviors. I could write a whole book about it. Yet, instead I will just share with you a little drawing of my composition that resumes quite well the 4 most irritable things that are part of the culture and the traditions and thus people's everyday life in Hong Kong. And if you try to say something they will usually give you a startled look as an answer as for them it is perfectly natural and they do not see any problems doing it to your face. 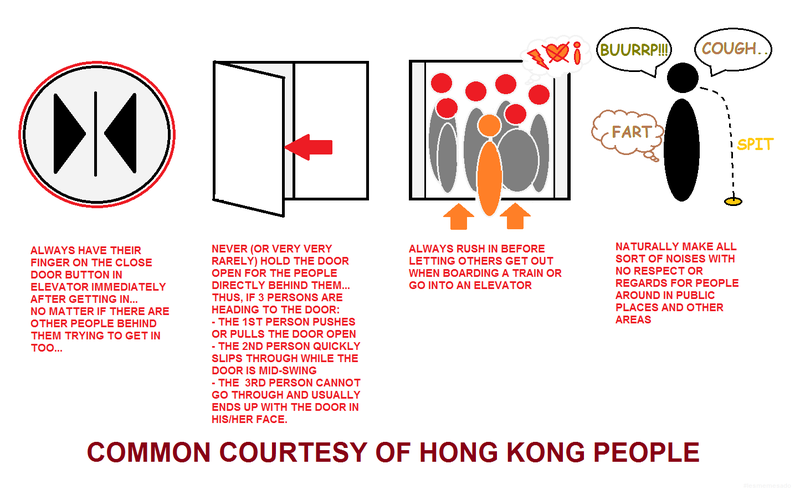 Common courtesy is not a thing in Hong Kong, and you better get used to it if you want to survive this concrete jungle.